We finally learn what becomes of CaptainSwan. *FLAILS* Meanwhile, in Hyperion Heights, Henry forms a new alliance. Full recap of Once Upon a Time “A Pirate’s Life” (first aired Friday, October 13 at 8pm ET|PT on ABC). In “A Pirate’s Life” we finally learn how all the hard won HEAs in Season 6 (especially CaptainSwan) can remain intact, despite the current curse in Hyperion Heights. And it is brilliant! The episode begins with Henry (Jared Gilmore) practicing his sword-fighting with Killian on the Jolly Roger in Storybrooke. Emma distracts Henry, who eventually loses to Killian. Unfortunately, Henry feels discouraged about his skills and walks away to brood by himself. Emma wants to comfort Henry, but Killian stops her. He’s growing up and the time is coming that he’ll leave home. Emma is concerned because she’s already missed so much time with Henry. However, Killian assures her that, no matter where Henry goes, he’ll always have a way to reach out to them. Killian shows her a magic bottle that can be used to send messages across the realms. We flash to Henry (Andrew West) in the Fairy Tale realm, a little while after deciding to stay and search for Cinderella. He’s hidden her glass slipper and is on the run from Lady Tremaine and the palace guards. She has convinced that that Henry assisted Cinderella in killing the Prince (false, because Lady Tremaine stabbed him herself!). Before they can capture Henry, he pulls out that magic bottle, pours out the water and sends a messge calling for Captain Hook, Regina, and Emma to come save him from the Lady Tremaine, who is holding him hostage. Lady Tremaine takes Henry to Cinderella’s room and asks Drizella to torture Henry until he tells where he’s hidden the slipper, the she is to kill him. Lady Tremaine offers no other information. 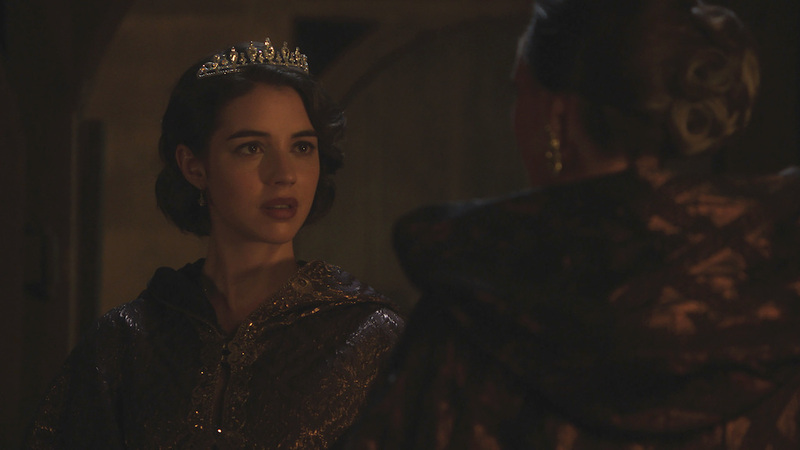 Henry tries to appeal to Drizella’s kind side, but finds she doesn’t have one. 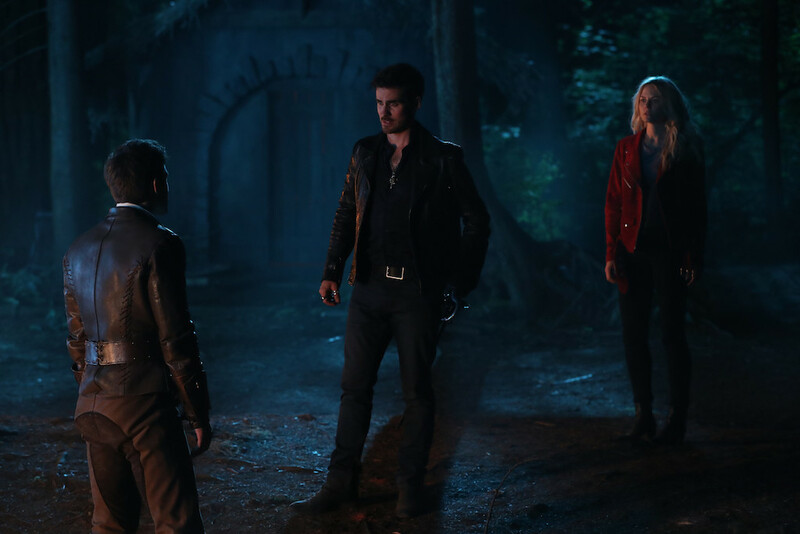 Before she can use a dagger on Henry, Regina and Killian arrive. Killian kills the soldiers, Regina knocks Drizella out, and they free Henry. It’s a very sweet reunion. But where is Emma? Killian says that she’s back in Storybrooke fighting off a swarm of tiny dragons (what???). But when Henry leaves the room, Regina accuses Killian of lying. Apparently, it’s what Emma wants…so what’s going on? When they get back to the forrest, Regina tries to do a location spell on Cinderella’s glass slipper, but it isn’t working. Instead, Killian suggests going to the port to see if there’s any information about Cinderlla leaving. And he insists on going alone. At the port, he meets Alt-Killian from the Wish Realm! When Henry sent the message to Captain Hook, Alt-Killian got it too. Killian and Alt-Killian fight and it turns out Alt-Killian isn’t a drunk anymore. He knocks Killian out and hides him in a cart. Alt-Killian plans to find Emma so he can have love and his own HEA. Alt-Killian finds Lady Tremaine and apparently that have some sort of relationship. He promises to make Henry go home, if she will help him to look like a younger version of himself. That way Emma Swan will definitely fall in love with him. Lady Tremaine uses Cinderella’s Fairy Godmother’s wand to do it. Alt-Killian (who now looks like our Killian) makes his way to Henry and Regina. Alt-Killian shares a note that he apparently got from Cinderella before she left town (not true). Henry is discouraged to be left behind and agrees to go back to Storybrooke. Alt-Killian is in the process of giving Henry a really terrible pep talk when Emma arrives! And nothing is wrong… she’s just pregnant! This completely throws Alt-Killian for a loop. Apparently he finds the idea of keeping Killian from his child abhorrent. Alt-Killian returns to the docks to free Killian. However, Killian is already free and they both get into a fight. In the process, Alt-Killian is stabbed with dagger. Then he makes a confession. This whole time Alt-Killian has been separated from his daughter who is being held captive by witch. He’s been cursed so he can never free his daughter, but true love is the cure. Alt-Killian makes a dying wish for Killian to find his daughter. Emma arrives at the docks and Killian begs her to save Alt-Killian. She asks Alt-Killian to hold on to hope and believe… and Emma heals him. The next day, Emma asks Henry if he wants to come back home, but he isn’t ready to. Henry wants to continue searching for his story (AKA Cinderella). Of course, Emma understands. Plus, Regina has just decided to stay with Henry in this new realm so they can be together too (Operation Next Chapter!). The two of them join forces with Alt-Killian, who continues his search for his daughter. 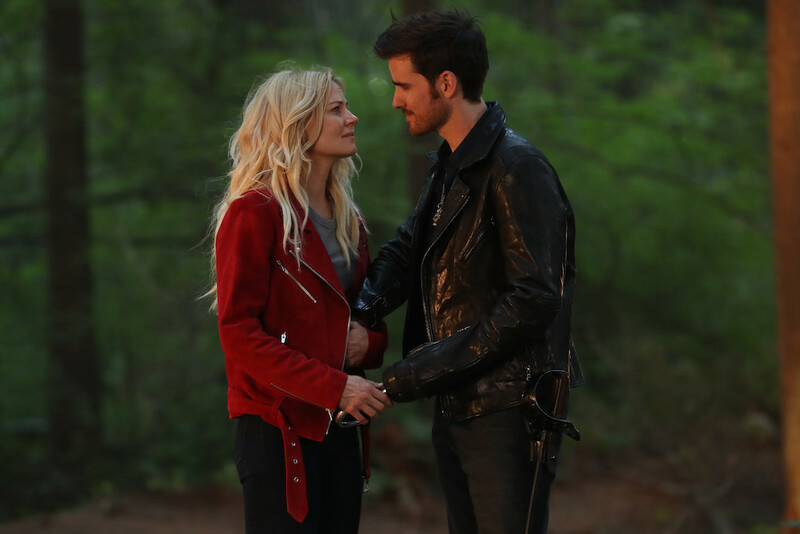 And so Emma and Killian return to Storybrooke (via a magic bean portal) and the CaptainSwan HEA (with a CaptainSwan baby) is wonderfully intact. In the present in Hyperion Heights, Detective Rogers comes to visit Henry. He’s read his book of fairy tales and can’t get the woman (Emma Swan) out of his mind. Rogers believes he knows her somehow, like he’s met her. But Henry maintains that she’s just a figment of his imagination. Before Rogers leaves, Henry asks for help to find where his family members are buried (because that cemetary he went to visit is not a cemetary). Detective Rogers agrees to help. Meanwhile Victoria is keeping Lucy away from Jacinda. Lucy has a ballet recital coming up and the only way Victoria will allow Jacinda to attend is if she buys a ticket for $550 (out of her pay range). During lunch at Roni’s, Tiana tries to help Jacinda find some side jobs to earn the money for the ticket. They’re interrupted by Henry who comes to apologize for ratting her out to Victoria. Jacinda doesn’t want to hear it and she’s even less interested in Henry offering to give her money. She isn’t a damsel waiting for a prince! Jacinda (and Tiana) eventually gets a catering job at the ballet! Interestingly, it’s Henry’s idea. As the bartender, he was able to convince the caterer to bring on two new servers. 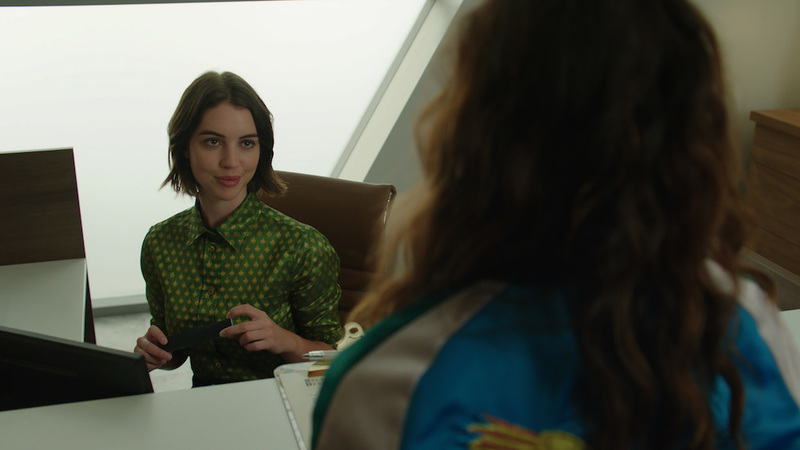 Jacinda is able to see Lucy before her performance and it’s a really sweet moment, especially when Lucy finds out that Henry is helping her Mom. It also seems like Tiana is feeling the Jacinda/Henry potential. Later, Rogers meets with Weaver, his new partner and apparently they have a big day ahead of them. Their first stop is Victoria’s office for a new job. She wants them to dig up something to get Henry Mills out of the picture and separated from Jacinda. They go to Roni’s to ask for information, but she refuses to give up anything. Then Weaver makes Rogers pay for his drink…ugh. But he does get a good piece of advice from Roni to be careful around Weaver, since he seems to circulate through partners so quickly. Rogers breaks into Henry’s apartment and as he and Weaver search around, they deduce that Henry has a daughter. This is a potential weakness they can use. When they receive a call from Victoria to come to the ballet recital, Rogers and Weaver leave Henry’s apartment. On his way out, Rogers snags Henry’s keys and swan keychain. At the ballet recital, Victoria and Weaver come up with a plan to plant her bracelet on Henry and frame him for stealing it. In fact, Rogers is going to be the person to do it. During the performance, Rogers walks past Henry and bumps into him. Presumably the job is done. Before folks can leave, Weaver makes an announcement that they are going to search the servers for the bracelet. Jacinda refuses and when Henry intercedes, Weaver elbows Henry in the face. Weaver then searches Henry… but the bracelet isn’t there (just the sean keychain)! Rogers didn’t plant it! Rogers refuses to do that to a man who has lost a daughter. Interestingly, Weaver is impressed with Rogers’ moral stand. When Weaver takes Victoria her bracelet, he reminds her that he is only willing to work with her as long as their goals allign. She doesn’t own him. At Roni’s, Henry nurses his bruise and Jacinda shares her own fears about being viewed as a helpless damsel. But she appreciates Henry’s help. This can be their second chance. Rogers joins Henry and shares a story that years ago when he was searching for a lost girl, he was shot in an alley Rogers was saved by a woman who looked just like the Emma Swan “character” in Henry’s book. She stayed with him until the ambulance came. (We know that this is the curse’s manipulation of Alt-Killian’s actual memory of Emma healing him.) Now Rogers is determined to be a hero and find that lost girl (HIS DAUGHTER). And like in the Fairy Tale realm, Henry, Detective Rogers (who is Alt-Killian!!!! ), and Roni make a pact to find out what Victoria Belfrey is really up to and expose her. All summer long, Team OUaT maintained that the HEAs that we enjoyed at the end of Season 6 would be OK, despite this Season 7 reset. Now that we know that Alt-Killian is Officer Rogers and our Killian is living his best life with Emma and Baby CaptainSwan in Storybrooke, I’m more than happy to enjoy our exploits in Hyperion Heights. Next week, back in the Fairy Tale realm, Henry, Regina, and Alt-Killian link up with Cinderella and Princess Tiana. 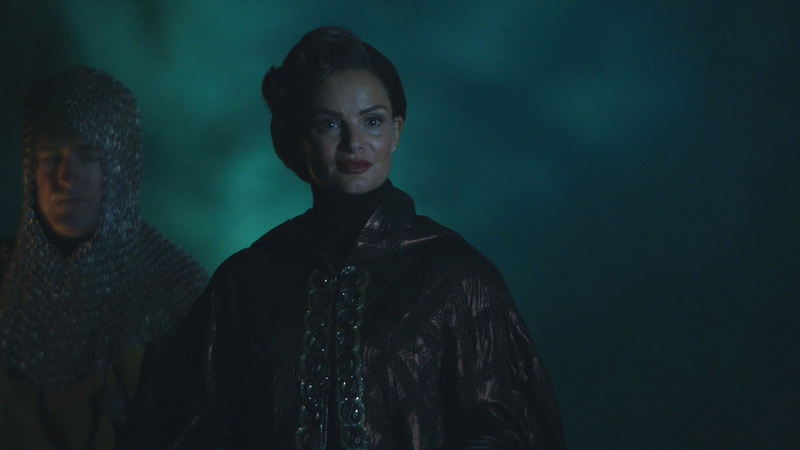 So, in past and present, we’ll see how these plans to take down Lady Tremaine/Victoria will unfold. Once Upon a Time airs Sundays at 8p/7c on ABC.